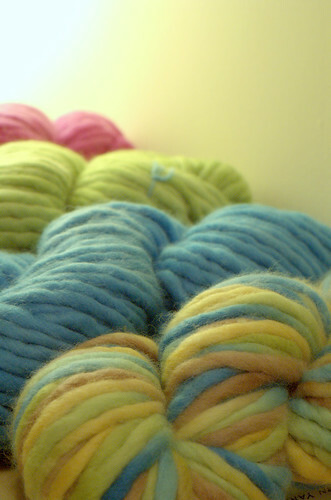 I've been hearing about Yarn Yard quite a lot lately, and finally succumbed to curiosity and went to check out the site. Before I knew what happened, four skeins of pencil roving were wending their way to me, all ready for spinning up into (what I hope will be) sock yarn. The picture doesn't even come close to getting across just how soft and squishy these are, or the depth (and subtlety) of the colours. There's one varigated in shades of yellow/pale green/pale brown and sky blue/teal, one solid turquoisey/teal/blue, one solid pale green (not ordinarily my kind of colour at all but this just grabbed me, and one solid bright pink/cerise. What I can't decide is whether I should mix and match, or try and make a pair of socks out of each skein of roving. What I do know is that I'm really going to need to hope the birthday fairy brings me more bobbins on Friday.